When 12 years ago Sharon and Bill Feipel went to pick up a fawn-colored pug, Otto, they also ended up taking home his brother, the runt of the litter. “It didn’t look like he was going to survive, so we took him, too,” Sharon recalled. They named him Odin, after the Norse god associated with healing, knowledge, battle, and sorcery. “He was mischievous and ornery, like the mythological god, but in a cute way,” she said. Odin spent his years in rural Illinois lounging with Otto, curled up with the family felines, trailing after the family’s black lab, staring down neighborhood pit-bulls and sidling up to strangers during big city jaunts until they were all charmed. Then, at age 11, the black pug, who didn’t get rattled by much, got cancer. The family geared up for the battle to heal him, while also doing their part to contribute to scientific knowledge about his disease. 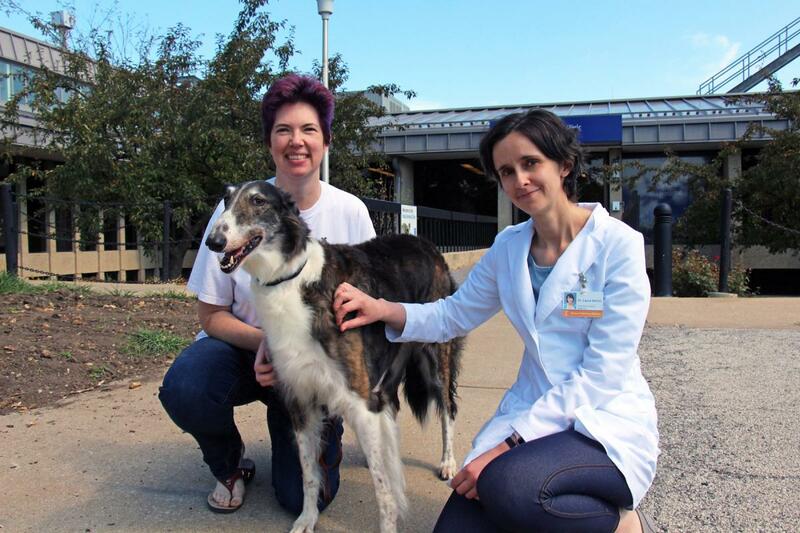 Diagnosed with a particularly invasive form of soft tissue sarcoma, Odin had been referred to the University of Illinois at Urbana-Champaign’s College of Veterinary Medicine, where he was operated on by veterinary cancer surgeon, Laura Selmic. Immediately following surgery on September 27, 2016, Selmic, with the Feipels’ permission, overnighted Odin’s tumor, along with some of his non-cancerous tissue to Duke Cancer Institute, where a team led by surgical oncologist and veterinarian Will Eward, MD, DVM, had developed a novel approach to precision medicine that will hopefully result in new sarcoma treatments for both dogs and humans. The core research team — made up of Eward; molecular biologist and basic scientist Jason Somarelli, PhD; gastrointestinal oncologist David Hsu, MD, PhD; and North Carolina State University comparative oncology geneticist Matthew Breen, PhD — is creating patient-derived xenografts, that is, taking tumor tissue samples from human and canine sarcomas and injecting each tumor sample into a living host. This is followed by an intricate process of drug screening and cross-species genomic analysis. While sarcoma makes up only one percent of all human cancers, it’s the third most common cancer in teens after lymphomas and brain tumors and accounts for 15 percent of canine cancers. Why compare human sarcomas to dog sarcomas? Any given sarcoma, in either species, could have thousands of mutations, Eward explained. But he believes that the most important genetic mutations — the driver mutations — will likely be those found in both human and canine sarcomas. That’s because most canine and human sarcomas are identical, canine and human immune systems are similar, and the two species, because they live in close proximity to one another, share environmental exposures. It’s very difficult to research and find effective drugs to treat human cancers. While billions of dollars are spent each year to find new drugs, less than one percent of drugs that are screened actually make it to patients. “You try and align mutations within a cancer with ways those mutations can be targeted by drugs and then develop creative ways to predict if they’re actually going to work,” he said. 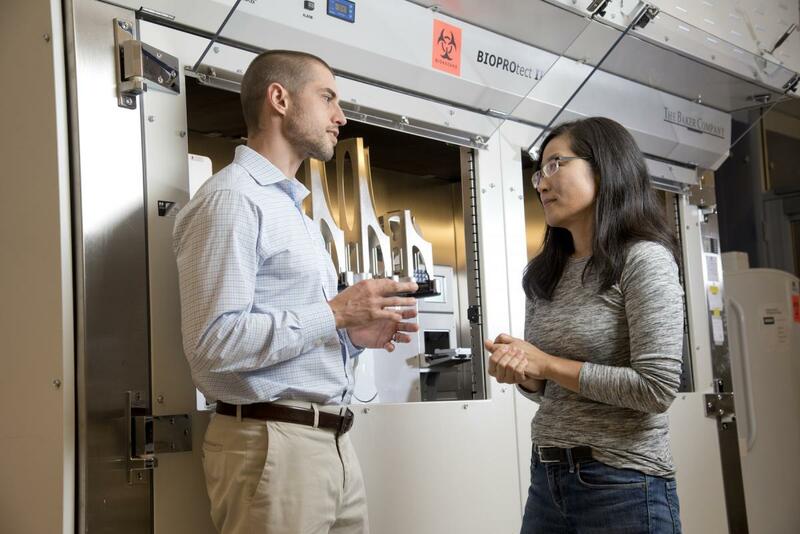 Over the past nine years, David Hsu has developed a robust system at Duke for creating human patient derived xenografts. With his first ones, for colon cancer in 2008, he learned that, unlike genetically engineered mouse models, the xenografts closely resembled the patient from which they were derived. His lab expanded to other solid tumors in 2011 and has, to date, attempted 216 human xenografts. Once a tumor sample is received from a canine or a human patient, Hsu’s lab moves fast to process it, then grow it in the host. When the tumor gets too big for that particular host, it’s resected and then injected into a different host in a procedure called “passaging.” Excess tumor tissue and normal tissue from the patient is banked for later studies. Simultaneously, Somarelli works with Erdem Altunel, MD, a visiting scholar from Turkey in Hsu’s lab, to grow cells from the tumor in a dish to develop cell lines for drug screening. North Carolina State University’s Breen, who was one of the investigators who first helped sequence the dog genome, sequences the cell-lines’ mutations. Somarelli and Altunel also work with DCI's High Throughput Screening shared resource, led by So Young Kim, PhD, to screen thousands of drugs on those cell lines, see which drugs work, then take the best of those drugs and test them directly on the canine or human tumor (xenograft) that’s growing in the host. "Anything that has the potential for direct therapeutic action is interesting for me as my background is in cancer genetics," said Kim. They’ve so far attempted 33 canine sarcoma xenografts (half of which have been successful) and 12 human sarcoma xenografts (half of which have been successful) since they began the project. They’ve completed a 120-drug screen across eight osteosarcoma cell lines (four dog, and four human) and a 2,100-drug screen in a cell line derived from one of their dog xenografts. Four new candidate drugs for osteosarcoma were identified as a result of the combined analysis of the screens and those are being evaluated to find top candidates for a potential dog clinical trial. Two of these drugs have showed significant tumor growth inhibition in xenografts. Odin the pug’s tumor, meanwhile, has “passaged” through one host, and there are plans to passage it again. Altunel and Somarelli are currently attempting to grow cells from Odin’s tumor in a dish so that drug screens can commence. Somarelli said that while they haven’t gotten to the drug screen stage yet with Odin’s tumor, his case is technically the closest they’ve come to developing and potentially using personalized medicine on a patient — dog or human. The research team has gotten to the drug-screen stage with other patients, but only long after the patients have passed away. Odin, however, is still alive. 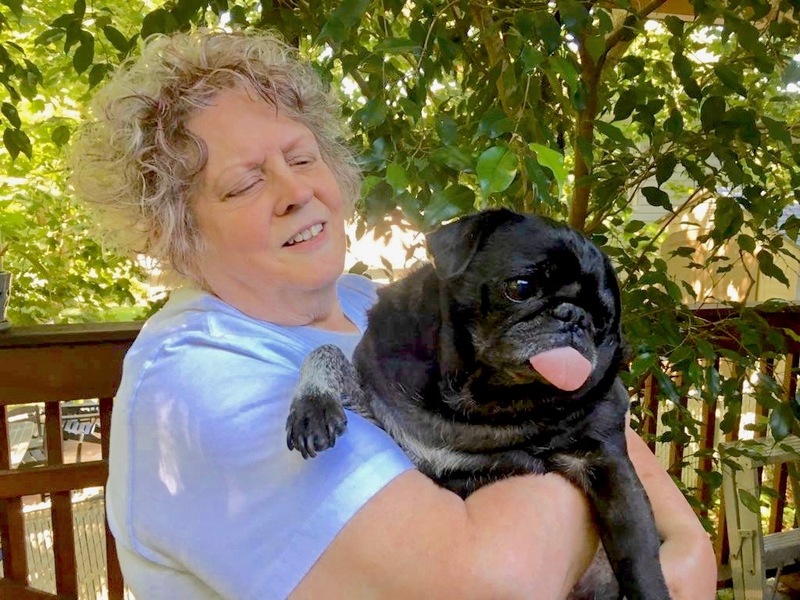 Following surgery last September, the pug underwent radiation treatments at the University of Wisconsin and a course of carboplatin chemotherapy. As of June 29, he was declared in remission. “Odin’s is an exciting case because, if we can move the screen forward and quickly validate in the xenograft, we can recommend treatment for him, should his tumor recur,” said Somarelli. The Feipels were thrilled to contribute Odin’s tumor for research. Selmic has sent many dog tumor samples to Duke, including Odin’s, since Eward first reached out to her last August — about 25 out of the 33 the team has received — because she believes in the work they’re doing. “I hope the result of their work will allow individualized treatment recommendations to be known soon enough to allow this information to be used to help dog and human patients,” Selmic said. While the research team will accept any kind of sarcoma tumor tissue — from children, adults, and dogs — they receive many more canine than human tumor samples, both because sarcoma is more common in dogs than humans and because the regulatory hurdles in the veterinary world are not as great. Funding to develop a personalized medicine pipeline for sarcoma treatment and conduct cross species genomic analysis is being supported by grants from the Consortium for Canine Comparative Oncology (C3O; a partnership between Duke Cancer Institute and the College of Veterinary Medicine at North Carolina State University) made possible, in part, by the V Foundation. A $250,000 scholar award for Eward from Hyundai Hope on Wheels, to expand the knowledge of pediatric cancer and develop novel approaches for associated tumors, will also support this canine comparative oncology research. The Duke Multidisciplinary Sarcoma Research Program hosted its annual Strike Out for Sarcoma 5K and Family Fun Walk on Sept. 10 to raise funds for the expansion of its research program, and is still accepting donations.